More than half a century ago, New York City suffered from a drought that lasted through 1949 and into 1950. By February, the desperate city had to try something different. Mayor William O'Dwyer hired a municipal rainmaker. Dr. Wallace E. Howell was an inspired choice. The handsome, thirty-five-year-old Harvard-educated meteorologist was the ideal scientist—soft spoken, modest, and articulate. No fast-talking prairie huckster, he took credit for nothing he couldn't prove with sound empirical data. Howell's meticulous nature often baffled jaded New Yorkers. Over the next year, his leadership of a small ground and air armada, and his unprecedented scientific campaign to replenish the city's upstate reservoirs in the Catskills, captured the imagination of the world. 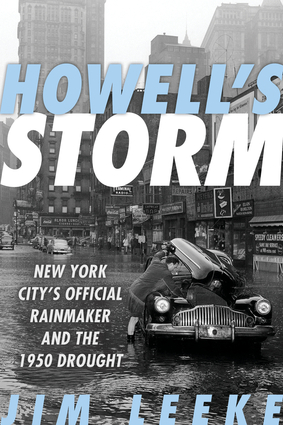 New York's cloud seeding and rainmaking efforts would remain the stuff of legend—and controversy—for decades.Howell's Storm is the first in-depth look at New York City's only official rainmaker—an unintentional celebrity, dedicated scientist, and climate entrepreneur, whose activities stirred controversy among government officials, meteorologists, theologians, farmers, and resort owners alike. Jim Leeke is the author of From the Dugouts to the Trenches, Nine Innings for the King, and Ballplayers in the Great War. A former print journalist, he has written extensively about computing, technology, and American military history.